Although it's been a tragically long time since Chipotle handed out free chips and guac or gratis burritos, the burrito purveyor is offering a new deal for what's perhaps the next best thing: free delivery. After all, it's hot outside and why wait in a long line during your precious lunch time when you can have a burrito bowl delivered right to your office? 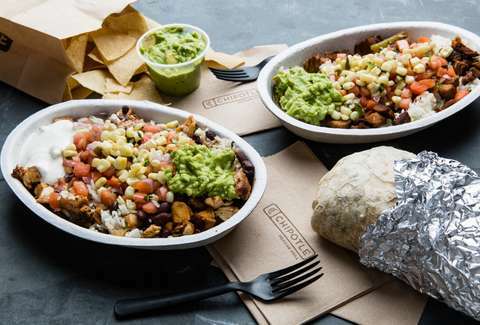 To celebrate its newly expanded partnership with Chipotle, the popular delivery service Postmates will waive its $3.99 delivery fee on your Chipotle order from now through Sunday, July 15, a company spokesperson told Thrillist. Postmates said it now delivers food from 300 additional Chipotle restaurants all across the United States, meaning there's a good chance you can have your usual burrito, burrito bowl, or order of tacos dropped off right to your door all this week -- without having to cough up an extra few bucks for the convenience. So, maybe don't feel so guilty when you "forget" to pack your lunch on Thursday. To take advantage of the deal for free delivery, all you have to do is place your order via the Postmates app and enter the code "CHIPOTLE100" at checkout. Chipotle first teamed up with Postmates for burrito deliveries back in 2015 and has become one of the most popular restaurants on the delivery service since. "We’ve already delivered over 1 million of their burritos and 2 million of their burrito bowls to our customers and we will continue to ensure that their food is delivered just the way our customers want it," said Dan Mosher, SVP & merchant lead at Postmates, in a statement. Postmates also announced it has expanded the scope of its delivery service to more than 100 more cities, increasing its reach to a total of 385 cities, or almost half of all US households. Newly added cities include Cleveland, Cincinnati, Salt Lake City, Santa Barbara, Memphis, and more. The news is a win for both burrito-lovers and lazy people everywhere. Tony Merevick is Senior News Editor at Thrillist and wonders how well a burrito holds up in transit. Send news tips to news@thrillist.com and follow him on Twitter @tonymerevick.